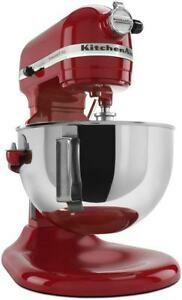 ★★★★★ Kitchen aid stand mixers have always been the bar by which all others are measured. I have had the Professional model for about 10 years and have been completely satisfied. I putchased this one as a gift and was impressed with the value. Quality is never an issue with Kitchenaid. ★★★★★ My wife loves this machine, with the attachment's it makes it easier for her to prepare meals. ★★★★★ Finally found, this item will be greatly appreciated each time it is used. Thank you!